Otters, the furry fish-eating mammals that popped up in Bishan and captured the hearts of many, made a surprise appearance at Changi Airport early yesterday morning. But the family of 10 on the tarmac were swiftly spotted by the airport's surveillance system. The airport's airside safety team were called in and the creatures were herded safely out towards Changi Beach, said the airport's spokesman. The otters were likely seeking shelter from heavy rain, veteran otter watcher Jeffery Teo told The Straits Times yesterday. They did not disrupt airport operations, the spokesman said, adding that this was a rare occurrence on its premises. She also said that "besides regular wildlife patrols, a surveillance system is in place to prevent and detect foreign object debris, including wildlife". Stressing that safety is a top priority at Changi Airport, she said flight operations are halted temporarily whenever wildlife is detected on the runway, for the safety team to remove the animals. Mr Teo, who has tracked Singapore's otters for more than five years, said the otters probably headed to the airport as the canals were likely full owing to heavy rain yesterday morning. "This family's home range is from Changi, Pasir Ris Park and up to Coney Island," he said. The otters caught on the airport's camera are probably from the Pasir Ris family, which has 11 members, including a pup photographed recently with a wound from a ring of metal wire. Mr Teo said fellow otter watchers, after viewing the video, were unsure whether the injured pup was on the tarmac as well. Mr Kalai Vanan, deputy chief executive of the Animal Concerns Research and Education Society, said it was "highly unlikely" that the otters would appear on the tarmac at night and disrupt flights as they are not nocturnal animals. The head of OtterWatch, National University of Singapore biology lecturer N. Sivasothi, said otters explore new areas only during an exploratory phase. "Likely, Changi Airport will act on the gaps where the otters squeezed through," he said. "The otters have other areas to utilise and are not being forced into the airport." There has been a movie about snakes on a plane, but otters? A family of the critters did not make it that far after being spotted on the tarmac at Changi Airport yesterday morning. 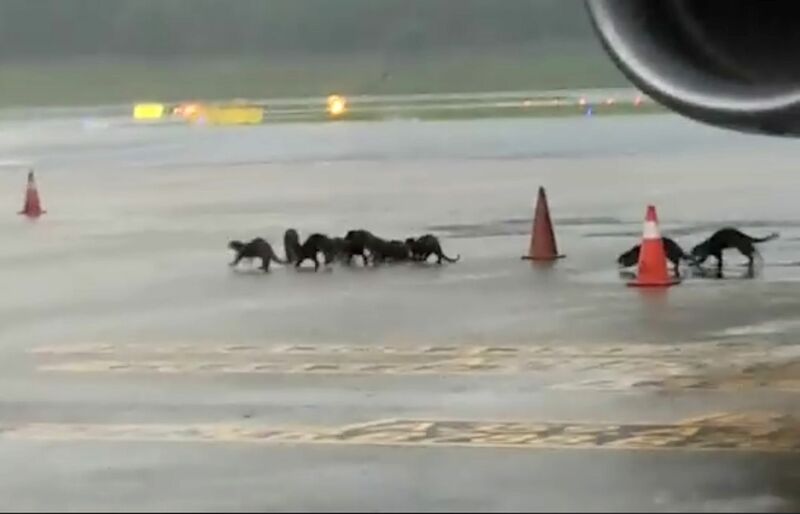 The airport's airside safety team herded the 10 otters safely out towards Changi Beach. An airport spokesman described the incident as a rare occurrence, adding that it did not disrupt operations. Experts said the animals probably went there while seeking shelter from yesterday's heavy rain, which likely caused canals to fill up. A family of otters is known to frequent the nearby Pasir Ris Park.